Cypress Cabinets has the latest and greatest countertops available in Monterey with a wide variety of colors, styles, and finishes. If you are remodeling your kitchen or bathroom, come see the breathtaking countertop selections Cypress Cabinets has for you. You don’t have to completely start over to make your kitchen or bathroom feel like a new room. Simply replacing the countertops in a room can vastly change the warmth and overall visual appeal of the space. With the aid of our professional designers, we can assist you in selecting the right countertop to fit your needs and your budget. Don’t settle for less than you want when shopping for countertops. Call the professionals at Cypress Cabinets and let us help you transform your home. 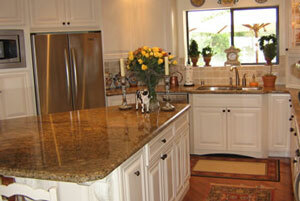 Cypress Cabinets offers the latest products for countertops. We offer Caesarstone and Silestone countertops. Both are composite counter tops made from over 90% all natural products but manufactured to be bacteria, heat, and scratch resistant. These long lasting features also come with a warranty to ensure your cabinets last as long as they were intended. You will not get that with standard granite countertops. Get the look of quartz, marble, granite, or glass in a material you can count on looking beautiful for years to come. Caesarstone and Silestone both offer colors and textures to wow you. Your guests will barely notice anything else once they see your countertops. Whether you are looking for a traditional or a super sleek modern look, we have the countertop for you. Imagine glistening white countertops that look like milk glass with a gloss that will not chip or scratch. Does not seem likely, does it? Caesarstone makes that possible. Do you prefer vibrant color? Silestone offers unbelievably bright colors that pop. Whether you are putting in a new kitchen, a bath, doing a full remodel or just replacing your countertops, we can provide the perfect surface solution for you. Cypress Cabinets not only offers sales and consultation of our countertops but also offers professional installation, as well. We can simply install your new countertops, or make them part of your total kitchen or bathroom remodel project done by Cypress. However, if you have a contractor you are already working with, we can simply supply the materials for them to install, as well. Our customer service remains the same whether you are just buying from us or having us install your new countertops. In the end, we want you to be happy with the countertops you have chosen regardless of whom you choose to install them. To experience our selection of countertops in Monterey, visit Cypress Cabinets today. Our sprawling 3,000 square foot showroom features many of our available products on display. Come in and let us show you the difference between all natural countertop products and the latest in high-tech options from Caesarstone and Silestone. Call or stop by today.